Wilson Fisk, the incarcerated ex-Kingpin of Crime, has a deal to propose to Iron Man: Hell use his underworld connections to help track down Captain America and his anti-Registration underground in exchange for consideration on his sentence. But can the Kingpin be trusted, or is he playing a deeper game? And how are the criminals of the Marvel Universe being forced to change the way they do business as a result of Civil War? 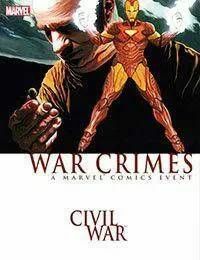 Plus: Delve deeper in the Marvel Universe underworld in writer Frank Tieris gritty prequel to Civil War: War Crimes! Career criminal Jackie Dio is fresh out of the Cage and looking for trouble. When he tracks down some of his old crime contacts, he discovers a lot has changed in the New York underworld - and finds more trouble than he bargained for. If hes going to have a shot at surviving, he may have to get acquainted with the shadowy figure known only as The Consultant - that is, if he even exists. Collects Civil War: War Crimes and Underworld #1-5.